When you are three feet tall, stairs aren’t just a means of passage; they are also hazards and barriers to your freedom. That is why the 680 kindergarten students at Toronto’s Fraser Mustard Early Learning Academy don’t have to take them. They move between the school’s two levels on a long ramp, through a triangular atrium that sits at the hub of the school. It seems like a small detail, but the ramp and other features of the building’s design specifically address the needs of three- to five-year-olds. 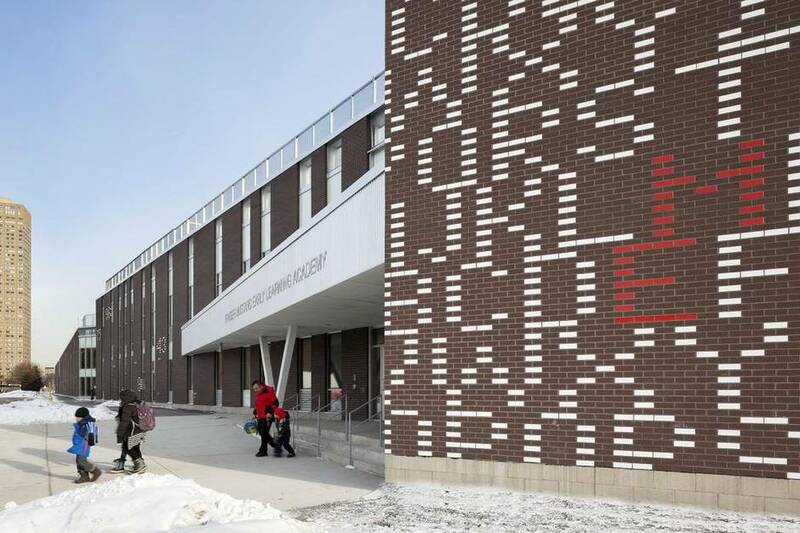 Despite a complex site, the building by Kohn Shnier Architects is beautiful, unorthodox and highly functional – an example of what design can do to answer the needs of a neighbourhood and of young children. The school was a puzzle in terms of space, financing and educational logistics. 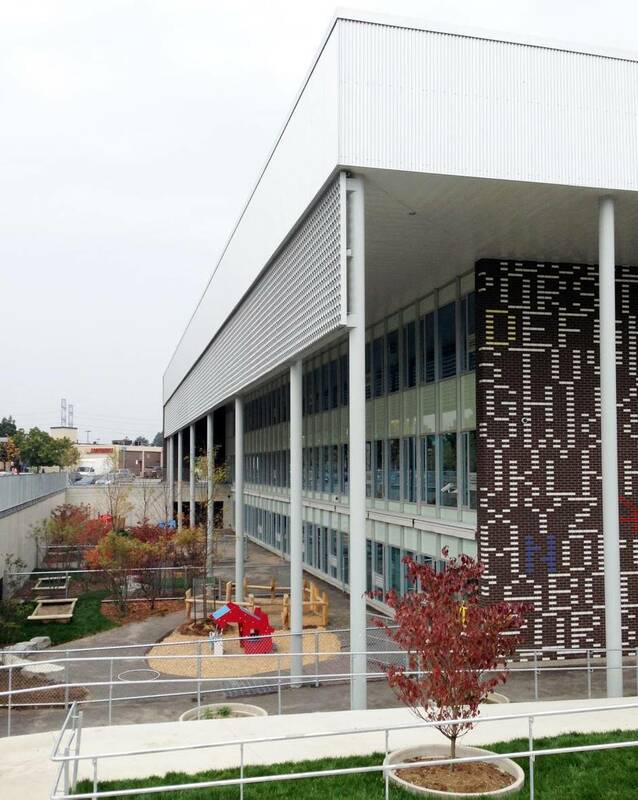 Located in the postwar Toronto neighbourhood of Thorncliffe Park, it opened last fall as a spinoff from Thorncliffe Park Public School – one of the biggest elementary schools in North America. Ontario’s introduction of full-day kindergarten meant TPPS would soon be bursting. After careful study with community members and board staff, Kohn Shnier called for an innovative solution: to build a new two-storey school on the old one’s parking lot, and designate it for kindergarteners. The resulting 80,000-square-foot building is a wedge, a skinny right triangle that shims between the older school to the southeast and the loading docks of a strip mall to the north. The brick facades incorporate an installation by the artist Micah Lexier, done pro bono, of ABCs and half-hidden messages: WELCOME! The existing schoolyard lies to the west and south, now cleared of portables and revived as a community space. The visual hush, she says, noticeably reduces the noise level in the rooms; teachers find their classes are unexpectedly calm. Kohn Shnier, led by architect Martin Kohn, embraced these goals. “We found that simpler was better, because there were more opportunities for [teachers] to do different things,” Kohn says. At the same time, the building’s architecture is expressive and surprising. The triangular atrium in the middle of the building is complex and uplifting; it has views onto the corridors of both levels, and a series of “monitors,” or windowed boxes on the ceiling, which funnel in sunlight. The school’s spatial arrangement is also unorthodox. The school does not have a full-sized gym. Instead, some of its play space is allocated to the atrium and to extra-wide corridors. Right now, these areas upstairs are being used for art and imaginative play; the atrium, once intended for meeting space, has balls and play mats. The school project itself changed course more than once. During the design process, a new component – a daycare centre – was added to the building; it opens this month in the basement level, facing a dugout where the field level has been lowered to provide outdoor play areas and full sunlight. Another shift came late in the process. The city required the school board to provide 120 parking spaces, and after negotiations with three nearby landowners fell apart, the school had to build them – on the roof. Teachers and staff drive their cars up a signalized ramp to park in spaces hidden on a concrete deck. The symbolism of that move is deeply unfortunate, since almost nobody in the school community drives. According to Ure, 95 per cent of students arrive on foot. The area’s cluster of high-rise and mid-rise apartment towers are, as Globe and Mail columnist Doug Saunders cast it in his book as an “arrival city,” a landing point for immigrants from around the world – these days principally South Asia – who then tend to find their way out of the area and into the Canadian mainstream. This regard for the broader community is mirrored by an ecological agenda: The building received a silver rating from the LEED program, which measures sustainability and building performance. The building uses efficient radiant in-floor heating, which also keeps kids comfortable as they play on the floor. There’s no air conditioner; skylights and windows are opened by staff and teachers to produce natural ventilation. It works, and saves money. It’s difficult to imagine a public building that does better at balancing social good, architectural quality and budgetary restraint. Sadly, it may be the last of its kind. The Toronto school board has been under public and government scrutiny – sometimes unfairly – for cost overruns and delays in its building program. New Toronto schools will be built following a template, devised by architects with experience working on the blank green fields of suburban sites. I hope those schools will be as thoughtfully conceived as this one.